UK Premiere of "Boiled Beans on Toast"
"Sharp and witty observation of Indians living in the modern world"
Watermans is delighted to present the UK Premiere of Boiled Beans on Toast, a new hit show by Primetime Theatre Company, one of India’s best known companies working in English language theatre and a regular at the venue. 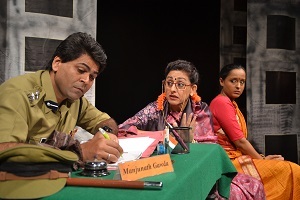 Written by the award winning contemporary playwright, screenwriter, director and actor, Girish Karnad, Boiled Beans on Toast is a sharp and witty observation of Indians living in a modern world. Set in Bangalore, the story follows the intertwining lives of six people and is an insightful slice-of-life portrayal of different classes of Indians co-existing under one roof. Performed in English, the characters include a grand-mother who discovers a passion for horse racing; a not very bright maid who learns to answer back; a bored-housewife who fulfils herself by undertaking charity work – all life is there in this searing saga of a modern metropolis. Boiled Beans on Toast is a brilliant contemporary Chekovian comic drama, examining aspects of a changing India. It premiered on Sunday 20th April 2014 at the National Centre for the Performing Arts in Mumbai and then toured India receiving rave reviews. Primetime Theatre Company was set up in 1991 by Lillete Dubey, an acclaimed actress of theatre, film and television. In the UK, audiences will know her as ‘Mrs Kapoor’ in the forthcoming The Second Best Exotic Marigold Hotel, where she plays, “Sonny” (Dev Patel’s) mother. However she has appeared in over forty Bollywood and international films including; Monsoon Wedding; Zubaida, Baghbhan and the original The Best Exotic Marigold Hotel to name a few. She will also be in the forthcoming Channel 4 Raj serial, Indian Summers. As Artistic Director of Primetime Theatre Company, she has directed over 28 productions and several of them have been presented at Watermans, London. 'Girish Karnad's plays of the last decade are brilliantly sharp, tongue in cheek observations of a contemporary India, infused with an empathetic understanding of the foibles of human nature. 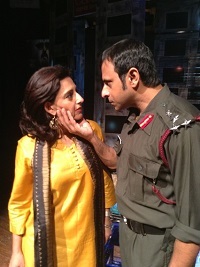 Boiled beans on Toast is a deceptively simple play, that in a non linear narrative, lays bare the aspirations and hopes of a large mass of Indians today, but also subtly explores several modern themes such as urban migration, environmental concerns, consumerism etc, all laced with a great deal of warmth and humour. The cast features the best talent from Indian stage and screen -- Joy Sengupta, Meenal Patel, Deepika Amin, Avantika Akerkar, Maneesh Verma, Swati Das, Avnish Mehra & Gillian Pinto. The show premiered in India to critical acclaim.